Look carefully at the image and complete the following tasks in as mush detail as possible. – Describe what you see in this image. Be descriptive. – Explain what you think has happened to this village. – Describe what it would be like to live in this area. I see the recherché men picking up the wood and all of the houses that have been destroyed which looks like a big tsunami has come and ripped the houses apart pieces of purple cloth are in the ruins of the beautifully structured stilt houses the dirty blue sea shows in the background wet dirty wood remains in the water floating disgusting water has washed onto the foreshore and the brown wood piled up. I think that a tsunami has hit because the water has rushed up to the woody foreshore and the houses have been torn apart from the ocean view. Devastating, this always happens to the Philippines because there such a small country surrounded by no other country’s that will protect them by things like this happening to them. I see houses destroyed and the people are trying to clean it up by moving the wood to a pile to clear the area for the villages to build their homes again. I think that there was a tsunami and it hit the and washed most of the villages stilts and some of the people might have died in the tsunami. I think that that it would be awesome to be there because if it was a hot day you don’t have to use tap water when you can use the sea and when it is night you don’t really have to worry about a fire because the heat is too hot to use a fire. I can see men in work clothes and they are trying to fix up the area because it is destroyed and no one can live in their houses unless they are rebuilt. I can see that there are men that are so close and I think that he is trying to find personal things that belong to people. There are people that are trying to pitch in and help other people try and clean up the terrible mess that has been left on the ground. I think that there has been a big accident. There have been houses broken and I think that the homeowners have been terribly sad and hart broken I think that no one was very happy unless it was on deliberate. It think that it would be good to live here because of the nice hot weather and the nice beautiful see and the nice quietness. I think that it would be nice to live here. Describe what you see in this image? Be descriptive? What I see in the image is three hard working men, two are carrying logs, and the other man is walking towards more wood. There are more men, it’s just these three are the clearest to see. I can also see tall wooden houses on stilts. It looks like some of the houses have been washed away by a tsunami or something. I think this because there are empty stilts with no houses on them. I can also see ginormous puddles in the middle of the picture, which is telling me that there has been a flood, tsunami or incredibly heavy rain. I can see that the sea is calm and this could mean that whatever caused this passed quite a while ago. Explain what you think has happened to this village? I think that a tsunami had struck this poor, small, wooden village. I think this because the wood is scattered absolutely everywhere and there are gargantuan puddles. The puddles are almost big enough to jump in for a swim. A tsunami is when the earth’s plates rub against each other causing parts of the world to shake like an out of control washing machine or dryer. Describe what it would be like to live in this area? Before the Disaster- I think this would be an amazing place to be living before the disaster because the Philippines is a hot place and it is girt by fresh, cold sea water. I would love to stay here because I am a confident swimmer and I also enjoy it. After the Disaster- I think after this horrifying disaster I would not like to stay here in the Philippines. I think this because it is possible that another disaster is near, and I could die. I’m pretty sure that my Mum, Dad, Brother and Sister don’t want me to die… I think. In the picture I can see 5 young men who are carrying chunks of wood and moving it to another pile. The men are wadding through the massive rain puddles. There are huts which are built on stilts standing in shallow water. There are thick, think, long and short pieces of brown damp logs lying scattered over the ground. The ocean looks calm and the sky is as blue as a sapphire with some white fluffy clouds. I think there was a massive Tsunami which struck the village with its mighty force. There might have been a Typhoon which ripped the stilts right out of the rough ocean. I think it was a Typhoon because there are huge puddles everywhere. 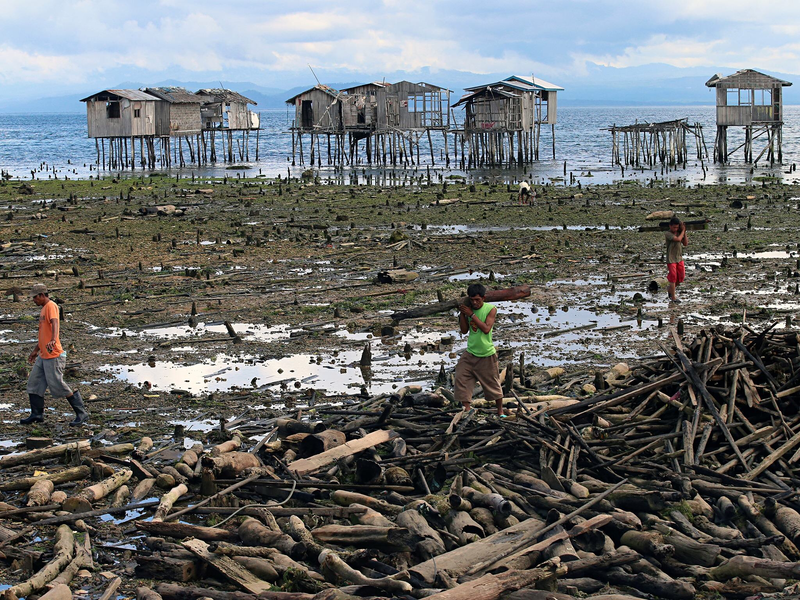 The village might have had a colossal flood which tore down the stilts and completely destroyed the huts. I think it was a tornado because there huts which look like they’ve been ripped in half. The huts have very bad dents which could’ve been caused by the flying chunks of damp wood. It would be very warm to live in the Philippines because the sun would be very warm. It would be great to live in this part of the Philippines because you can go swimming nearly every day if the weathers pleasant. I think it would be terrible to live in the Philippines because you would have to suffer with Tornados, Typhoons, Tsunamis and considerable storms which are absolutely atrocious. Describe what you see in this image be descriptive- I can see strange people walking around strangely. I see lots of brown logs just laying around. I see little houses. I see the beautiful sky. I see the golden sand. Explain what you think has happened to this village- I think there has been a terrible tornado. I think there has been a horrible tsunami. Describe what it would be like to live in this area- It would be horrible if something terrible like this has happened. It would be nice at start if this did not happen. I it would be good because it would be nice and hot. I can see people taking pieces of wood and throwing it onto a massive pile of other wood. I can also see houses on stilts standing in the middle of a deserted village rotting away. Also there are lots of puddles all around the area. I think that there has been a tsunami there because there is lots of puddles around, they are near the ocean and also there is a lot of damage, for example: broken wood everywhere and also near destroyed houses. I can see wonderful people coming and getting the wet wood from the disaster and putting it into the pile. They are doing this because of the disaster what happened what happened. I can see the ocean behind there what looks like that was the reason the house fell down. I thing they are on stilts because the water gets higher into the land at night. I think that there was a horrible tsunami what made most of the homes fall down but I don’t know how the first couple of house didn’t fall down it would mean that it went over or they are just stronger house then the other house. I also think this because the ground is wet right after the disaster so that might mean it was a flood or a tsunami but I don’t think the a flood could take down that much house and other things on the la- Describe what you see in this image. Be descriptive. I think it would be horrible because of the water and at night the water would come up and because it will bring stuff in like crabs and sea weed. I think it would be good to wake up to the beautiful sun set every day. I think it would also be good because of the water you could swim every day. I think that I wouldn’t cope living here because it doesn’t have the inter net and power so I couldn’t do much things I like to do. I could live there because I would get to explore the beach area and maybe make a little house I can hang out at because I would like doing that kinder thing. I think that I could cope if I never lived with inter net because if I didn’t live with the inter net I wouldn’t know what it was like and I would find things to do but now because I had inter net most things are boring. Describe what you see in this image. Be descriptive: I can see lots of crushed up wood most likely from the trees or the broken up houses that are just sitting there in a broken up look. And I also see some people picking up some wood of the ground near some massive puddles. I can also see some people on the beach playing in the water not noticing the big mess by the beach. Explain what you think has happened to this village. I think it was a tsunami that demolished the houses on their stilts because a tsunami is really strong and in fact if it was any stronger I bet all of the stilts would have broken leaving more damage. I don’t think it was a good idea to put the houses on these big stilts because a really strong wave could have demolished those houses in seconds. Men are strongly lifting up piles of wood getting moved somewhere. Houses that are standing on powerful logs. The clear see through water is crashing to the sandy shore getting closer to the houses. Maybe a massive wave what was heading towards the shore overnight because there are puddles all over the places. I think it was a huge wave had tear through the villages. First before a natural disaster it would be wonderful, beautiful, amazing, feel like it’s a dream and nice to cool off for a lovely swim. When the natural disasters came it would feel like disappoint because what has happen where I would live. I would feel terrible because everything is ruined. I can see three men lifting wood to maybe build more homes and find childhood stuff. I see the ocean and homes on stilts, water everywhere, and wood everywhere. There are three people moving wood in a stack. – Explain what you think has happened to this village. I think that there was a Tsunami that washed everything up and broke homes there was only ten homes standing up right and the rest have fallen down. It would be very warm at times then it would be cold a lot it would have been nice to live up there In the Philippines learn their culture and what they do up there and yes I would like stay there one time in my life.